With the term in full swing, we are continuing to celebrate the success of individuals, volunteering across the community. With over 300 volunteers, the Leadership Academy has expanded massively over the last few years and so, each month we’re showcasing one volunteer who has demonstrated an exceptional commitment. Whether it is making a difference in their local community, or impacting the lives of fellow students on campus, we want to hear your stories. UoN Sport Leadership Academy would like to congratulate Kilian Bachmair on being our Volunteer of the Month for November! 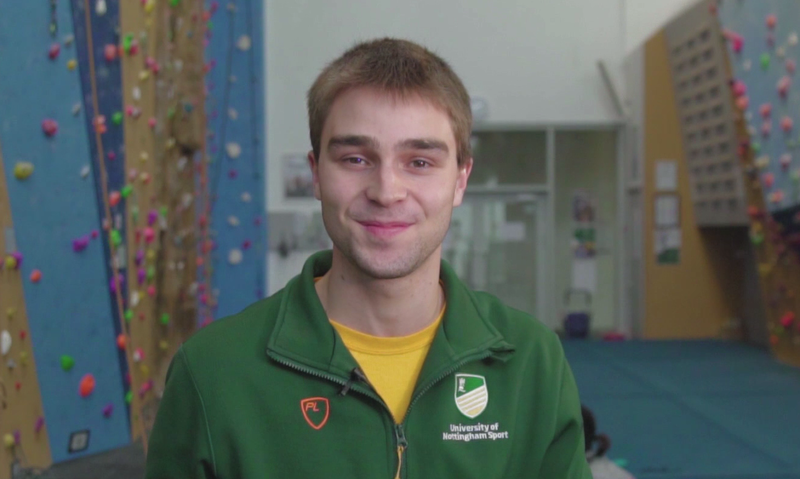 Kilian has been awarded November’s Volunteer of the Month for his commitment and initiative with several climbing programmes. In June, Kilian initiated a marketing campaign to increase outreach of the Inclusive Climbing Engage, by distributing flyers and creating promotional content. From this hard work, Kilian is now an Inclusive Climbing Ambassador – a role specifically created for him in recognition of the work he had initiated. Climbing has a wide range of opportunities to suit all levels and abilities, from inclusive sessions, Engage social sessions, and competitive climbing. Kilian’s commitment to the Inclusive Climbing Engage programme has allowed more students of a variety of abilities to access this opportunity. Kilian has developed many skills himself and the programme has also benefited him. Although time management takes practise, Kilian also talked about what he loves about volunteering and why it is important.